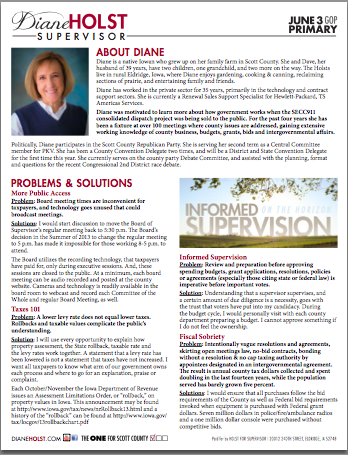 Each year I like to bring attention to the announcement made by the State of Iowa, in late Fall, concerning the Rollback. You may know that we are not taxed on the assessed value of your property but on the “taxable” value. The taxable amount is determined by applying a percent (the Rollback) to your assessed value. Residential and Ag properties are tied together in the Rollback formula. If either of those classifications increase in value, the taxable value of both classifications is allowed to increase. The maximum set by law is 3%, and this year an increase will be applied to both classification. What this means is we are going to pay a larger percent of our assessed value in our taxes. Throughout my campaign, I was getting the message out that the tax burden is going to be shifting to residential and ag. The state saw the need to provide tax relief the commercial and industrial properties to help them through these more difficult times, as well as implement a reduction in the taxes paid on multi-residential properties. The following is the announcement by the state that we will be now be taxed at 55.7335% of assessed value, up from 54.4002% last year, and it provides information to further explain the process. 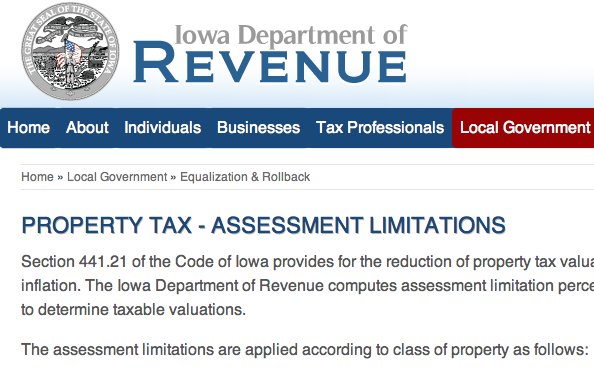 Des Moines, Iowa, October 31, 2014 — Today the Iowa Department of Revenue issued its annual Assessment Limitations Order, or “rollback,” on property values in Iowa. The Order adjusts the property values used by local governments to compute property taxes for agricultural, residential, commercial, and industrial property. This year’s Order implements the second phase of the commercial property rollback featured in Governor Branstad’s comprehensive 2013 Commercial Property Tax Reform package. The 2013 Order reduced the taxable value of commercial, industrial, and railroad properties from 100 percent to 95 percent. This year, that taxable value is further reduced to 90 percent. Additionally, the increase in taxable values for the agricultural and residential property classifications is limited to three percent. ·The taxable value for residential property is 55.7335% of the assessed value. This is an increase from the 2013 level of 54.4002%.Residential property includes farm dwellings. ·The taxable value for agricultural property is 44.7021% of the assessed value.This is an increase from the 2013 level of 43.3997%. ·No adjustment was ordered for utility property because its assessed value did not increase enough to qualify for reduction. Utility property is limited to an 8% annual growth. County auditors will apply the adjustments to each property classification to compute the taxable values used to establish property taxes. Tax liabilities based on the 2014 taxable values are payable in fiscal year 2015-16 and will not be determined until local taxing bodies establish their property tax needs early next year.